Years ago, back in East Vancouver, I lived next to an Italian guy named Mario. Mario had a beautiful garden, in which he had built a sort of tent thing covered in thick, clear plastic sheeting. In this tent thing, he grew masses of the most wonderful Roma tomatoes and an embarrassment of shiny, healthy basil plants. Mario noticed my interest in gardening, and every year, he’d give me his extra tomato and basil seedlings. Every year, I would plant and nurture these seedlings, and every year, they would grow into sad, leggy plants. The tomatoes would get blossom end rot, and the basil would produce maybe ten usable leaves, and I would look over the fence at Mario’s tented jungle and feel that somehow I had let him down. Every fall, he would come over with a couple of grocery bags of tomatoes and a large bunch of basil and say, “It’s okay. They’ll be better next year.” They never were. 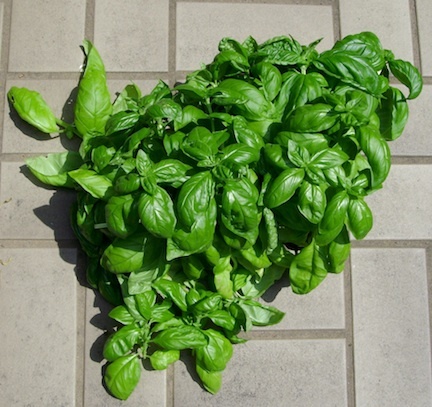 Holy crap, wouldya look at this basil?! ?